Black garlic is just that: black! The garlic bulbs are slow roasted for a very long time to create these beautiful, shiny, soft, balsamicky cloves. They are so soft you can squeeze them between your fingers and so tasty that you just want to eat them all up as they are…however, I have forced myself to actually cook with them and not just eat them!! I’ve added black garlic to endless dishes in their original form and it adds a lovely extra to any dish..
I’ve read a lot of harissa recipes, and made a lot. 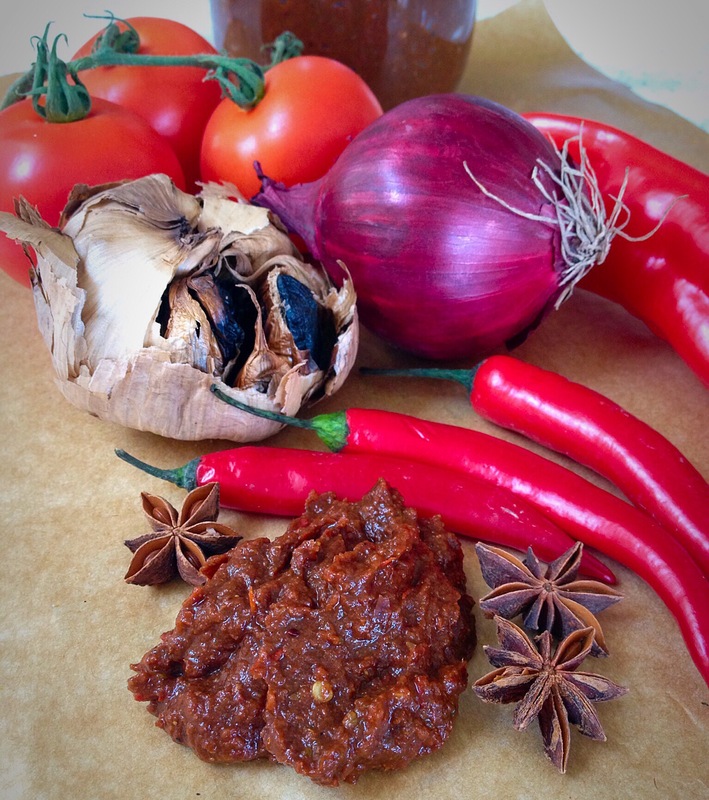 One of my favourites is Kellie’s, which I’ve used and amended to my tastes quite a few times now; I recently read another version in Thomasina Miers cookbook ‘Chilli Notes’ in which she roasts all of the vegetables and this was my starting point for my black garlic harissa. Roughly chop the peppers, tomatoes and onion and toss in olive oil with whole chillies and black garlic cloves. Season and roast in oven until they start to char and become soft. In a warm pan, dry fry the spices gently until the aromas start to release, ensure not to burn them. Remove from heat. Add everything to your food processor, scraping the vegetables from the oven pan along with all of the lovely juices and oil and mixing with the spices. Whizz to a consistency you like, I like mine a bit chunky. Add lemon juice a little at a time to suit your taste and mix well. The lemon juice really lifts the flavour and brings out the taste of the black garlic. Stir dried or chopped coriander through the mix. NOTE: I found this quite spicy to I threw in some extra oven roasted tomatoes to take the heat down a bit. Store in a clean jar with a layer of olive oil over the top to preserve the harissa. OR…like me..dig in with a spoon!!!! 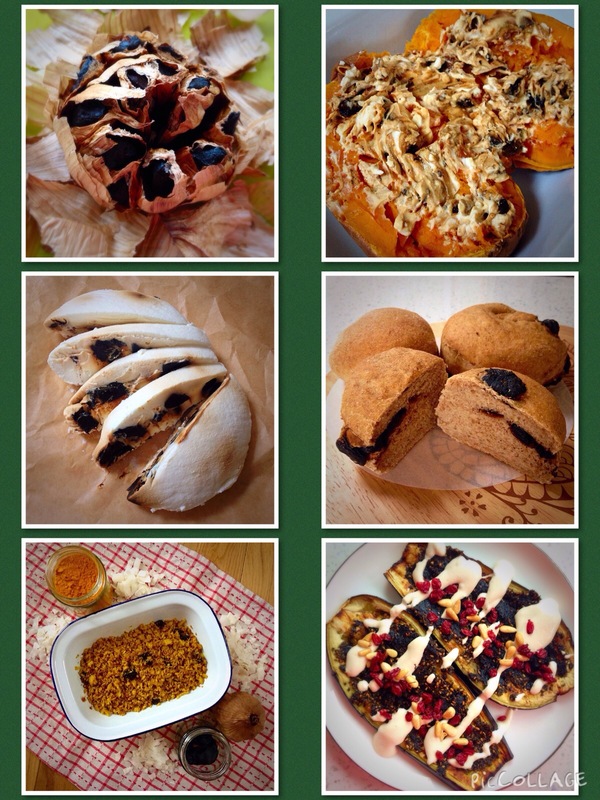 Over the next week I will be sharing lots more recipes with black garlic and hope you like them. If you fancy trying black garlic for yourself (and I highly recommend it!!!) visit the brand new online shop and enter ‘foodbod’ as your discount coupon code and receive 10% off the prices plus free shipping until 28th February 2015. Enjoy!!! I have not been paid to tell you about black garlic, I do not work for Balsajo, I am merely sharing something that I love with you because I just can’t keep it to myself!!! 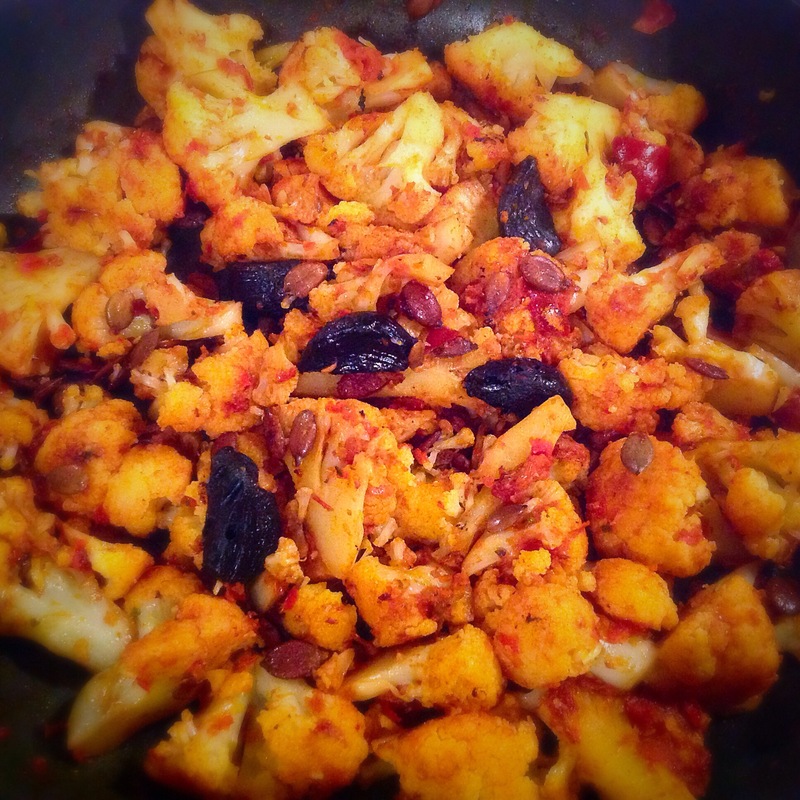 This entry was posted in Cookbooks, Healthy, Mezze, Middle Eastern, Roasted Vegetables, Sugar Free, Vegan, Vegetarian and tagged balsajo, black garlic, cooking, harissa, recipes on February 20, 2015 by Elaine @ foodbod. I’m not sure if they deliver to Germany though… WIll have to see. Oh yes, perfect. Couldn’t really find it on their website. I bet its yummy with chicken. I’ve never tried black garlic before but i love love LOVE garlic so I need to try it out asap. This sounds super creative, Elaine; only you can come up with such healthy and delicious variations of common dishes. Simply love the pictures! Ha ha! A fleeting thought I’m sure!! [grin] True, O king ! PS did you see Angie’s comment on your post? Awesome, just let me know! Do you mean Angie’s comment about shipping the chiles? If so, I don’t think they would ship very well…the chocolate might melt… Is that the comment that you meant? No, I mean her comment about saying your recipe for me last week was the recipe of the year!!! I have never seen black garlic before. Im sure that it will be flavor packed. 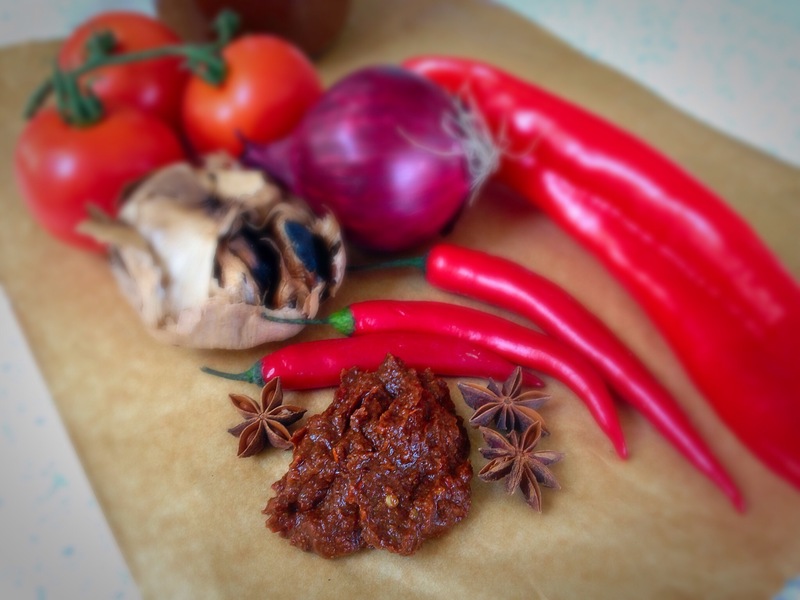 Ur Harissa recipe looks really nice. 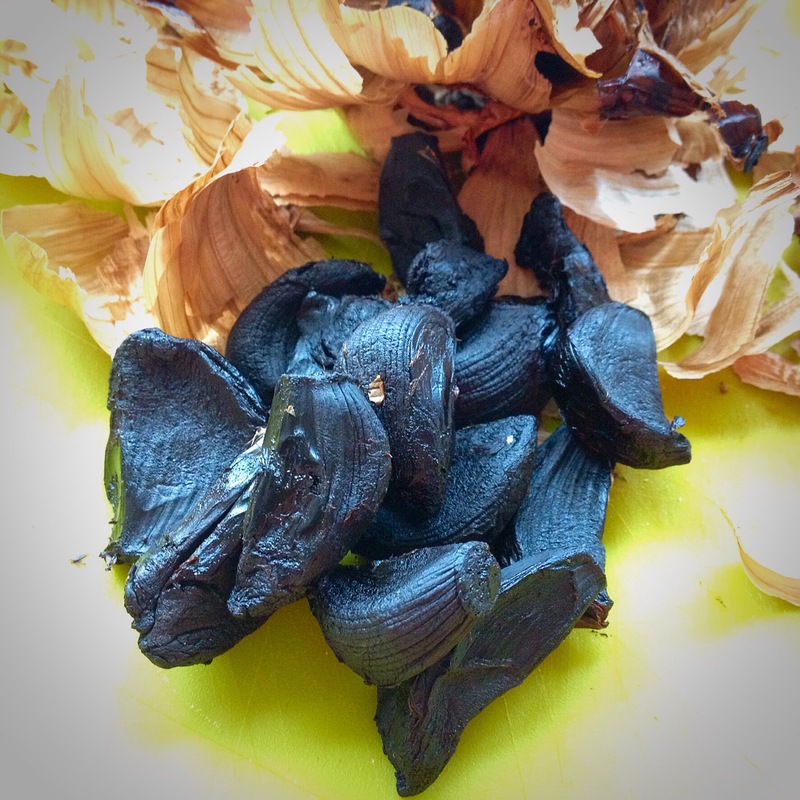 Well, one thing about black garlic : no stinky breath! Now you can have garlic AND friends!!! Good to know! I always hat the theory that garlic does not really prolong your life, as it is often claimed, but instead shortens that of your friends and co-workers, leaving you with the false impression that garlic was good for you! I know exactly what you mean!!! I don’t know how my family put up with me at times! I just love garlic and have been hearing so much about black garlic. I am very anxious to try it. The way you have used it look amazing! 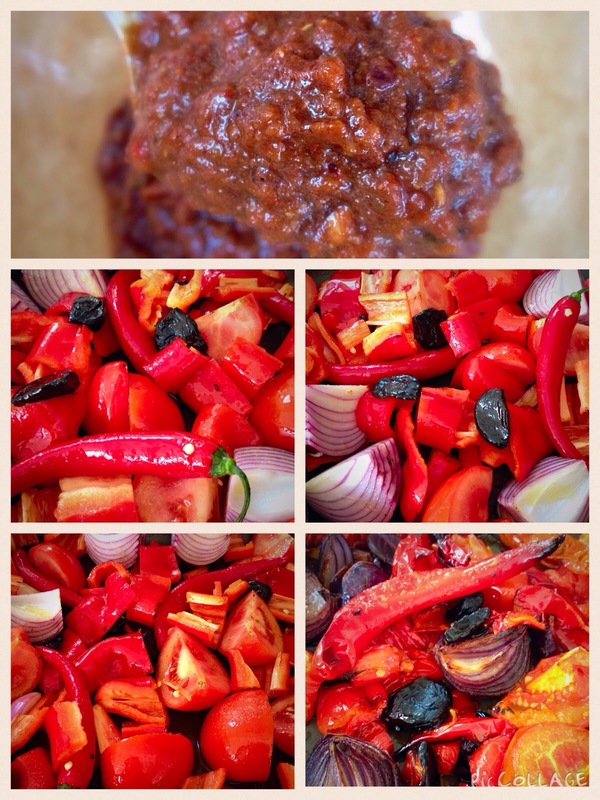 This harissa looks so flavorful. Have heard but never found black garlic. That harissa looks AMAZING!!! Thank you 🙂 well, now you can try it! Interesting. I’ve never seen black garlic before. Never tried cooking with black garlic. This looks very nice. I will try now. I love great garlic and these black bulbs would work very well in one of my Mexican one-pots! I am drooling over this and am waiting to lay my hands on some black garlic.Do you think I could use roasted plain garlic as a substitute, Elaine? Pingback: Zwarteknoflook.nl | Een geur armer en een smaak rijker!